Sometimes being a not that successful predator means that you have to try other things. In Wile E. Coyote’s case it’s being an artist and using that skill to paint landscapes. It’s not the fact that he can do this beautifully at great speed. It’s the dimensionality of them. The downside is that this change can only seemingly be accessed by Road Runners. 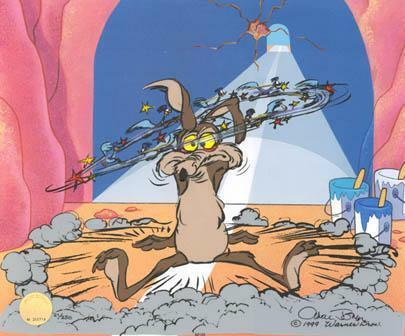 This small problem has caused great pain for Wile E. as 10 times out of 9 he then tries to follow the Road Runner but due to the nature of physics as applied in cartoons that path to salvation isn’t available to him. This then causes a plummeting and then a few weeks on a rack getting his back put back into place and the other injuries suffered from the several hundred foot fall to the valley floor below. Back to his artistic abilities, our resident Evil Genius has discovered a superpower. We need some more testing to see if it’s just Coyotes that cannot run into the new dimension that his paintings open up. I would like to see where the path goes to when we make the turn. It maybe just a small wormhole type construct that is connected to the nearest safe place to continue your run. Otherwise could you just get shot off sideways? 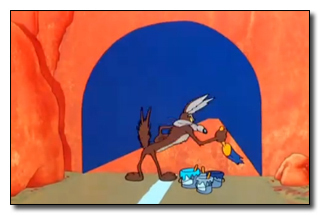 It may not be the skills of Wile E. that produces the effect of opening up that new dimension but a side-effect from the ACME paint. With everything else that ACME produces and the odd side-effects that a lot of their products. This one can be seen as one of the nicer ones. One that doesn’t leave a smell of burn fur that takes weeks to get out of the cave or the time spent having your spine manipulated back into shape. It’s just good that the spinal cord of a cartoon character seems to be indestructible and will grow back if one part of the body is split from another.